Trim and rinse the livers, and set aside in a colander. Melt all the butter in a large frying pan over a medium heat, add the spring onions and thyme, and cook them gently in their bath of butter for 3-5 minutes, or until the onions are soft but not browned. Stir in the garlic and cook for another minute, with out allowing it to burn. Now turn the heat up, add the livers and fry briskly for 3-5 minutes, or until the livers are lightly browned on the outside, but still rosy in the middle. Tip the livers and their juices into a blender. Deglaze the pan with 2 Tbsp Verjuice, stirring and scraping to dislodge any bits. Bubble for 30 seconds, remove the thyme and pour the pan juices into the blender. Blitz to a fine, smooth paste, then add the cream, and whizz again until just combined. Season to taste with salt, pepper and nutmeg, then pour into a paté dish (or individual pots), and smooth the top. Cover with clingfilm and chill for 3 hours. To make the jelly, pour the half cup of Verjuice into a small bowl. Sprinkle the gelatine on top and leave to ‘sponge’ for 3 minutes. Set the bowl in a pan of simmering water, halfway up to its waist, and leave until the mixture is clear. Allow to cool for 3 minutes, then pour the jelly over the paté in an even layer. Sprinkle with thyme leaves and black pepper, then refrigerate until the topping has set. 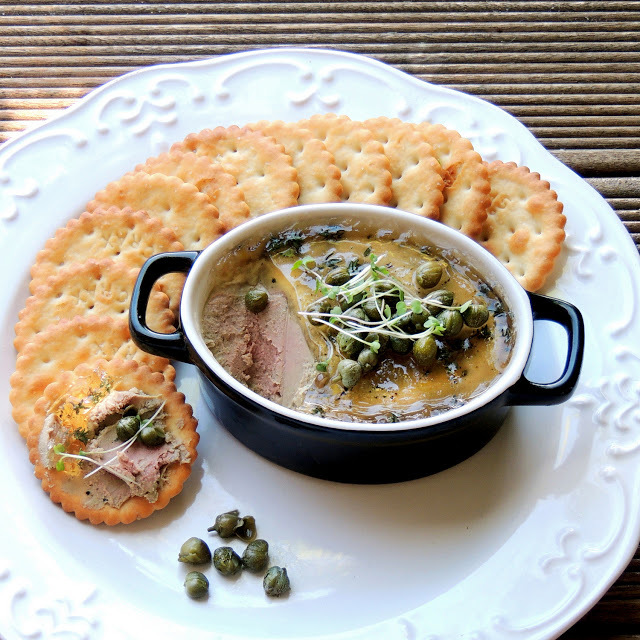 Serve with bread, crackers and capers. Serves 6-8 as a snack.